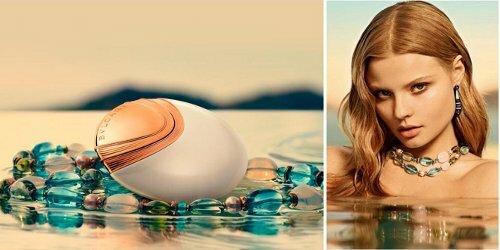 Bvlgari's new Aqva Divina was inspired by Botticelli's Birth of Venus and is "graced with the most sun-kissed wonders of the Mediterranean".1 Translation, as executed by perfumer Alberto Morillas: it's a "Floral - Solar - Watery" fragrance. The start is appropriately dewy, with a "salty bergamot" note, although if you assumed such a thing would be light as air, think again — it doesn't feel heavy on skin, but it radiates farther than you might expect (a spray on a blotter could be smelled throughout the first floor of my house). The "pink ginger" in the opening adds a nice zing for the first few minutes, then it's rather subdued (my first thought was that an Aqva Divina Zenzero flanker could be sort of nice). We move on to "the gracefulness of magnolia" (I guess, although it's sheer and dewy enough that if they'd called it some other flower I would have accepted that too) and some "sunlit quince" (yes, there are vague fruity undertones adding a slight tartness to the heart notes). And then, "the voluptuousness of amber" (depends on what you mean by voluptuous, I suppose — we're talking a very sheer woody musky amber of the Eau des Merveilles sort) and beeswax (a dab, perhaps, smoothed over with a just-barely-there dusting of powder). Verdict: Aqva Divina is a salty-musky skin scent with a few petals strewn on the shore and a smidgen of lemon cream, sort of like a morning version of Calvin Klein Reveal's "hazy Summer sunset". Bvlgari calls it watery (and the commercial is appropriately wet) but it's nothing like a traditional aquatic, and despite the reference to the goddess, to my mind, a man could easily get away with Aqva Divina. As for me, I am impressed. I guess I'm a "lapsed fan" of Bvlgari, in that I adore several of their pre-2005 fragrances but have not loved the more recent output (although I have yet to try any of the Le Gemme series). I don't need a bottle of Aqva Divina, but it's quite well done (I'd wear it if that cute little 40 25 ml bottle, shown below left, fell from the sky) and easily my favorite recent fragrance from the brand. And if it turns out that salty-musky skin scents are the new thing, that would be just fine with me too — for a time, at least. 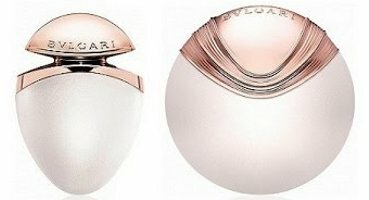 Bvlgari Aqva Divina is available in 25 ($50), 40 ($70) and 65 ($90) ml Eau de Toilette and in matching body products. 1. All quotes in first and second paragraphs are via the Bvlgari website. i am intrigued…salty musk? The bottles are pretty and the prices are great! Give Reveal a shot too. I don’t think either of them are absolute genius, but they’re both well done. Hm, I didn’t really expect to find this compelling (“watery” conjures a diluted drink in my mind), but I agree with Bardot: salty musk DOES sound intriguing. Maybe this will be a stop on the frustrating train ride that is my search for a summer musk …that I can actually sample in stores. I ended up trying this today and the salty musk is pretty nice. I got a weird, strong candy-like note for about 30 minutes, though, that was somewhere between a green apple and watermelon Jolly Rancher. But minus the hard candy, this makes me think of daytime on a cruise ship or summer vacation in the Caribbean, and it’s hard to hate that! Sounds like you maybe got more fruity/aquatic than I did? Hee, hee, Robin. Another one of your reviews in which I am kept on the edge of my seat until the end. I was thinking that your verdict would go the other way. Thanks so much for your detailed reviews! I really appreciate them. Actually, I just carefully re-read the review (it was too loud to concentrate in the cafeteria), and now I totally get your verdict! And I thought I’d go the other way, LOL…was not excited about this one! Will try this for sure since they carry the full line at the Ulta near me. I want to try both CK Reveal’s too, but it was a Macy’s exclusive up until recently if I’m not mistaken. Divina might be a Macy’s exclusive at the moment in the US? I’m not positive. Your right, guess I have a reason to go to Macy’s now. Or wait….I’m sure this will be at Ulta eventually. Although offhand, Ulta & Macy’s are surely my least favorite perfume stores since I never manage to snag samples at either! Ha! And I thought Saks was the worst but even there, I sometimes get lucky. Macy’s – never – unless I bought something and I can’t remember the last time I bought perfume there (except Origins Ginger Essence which is not in the regular mainstream line-up anyway). Saks is bad too, I agree! But at least it’s usually an otherwise pleasant place to shop. Macy’s is just dismal all around. Lovely bottle. Was out with a friend the other day and we came across a perfume counter and I told them to give this one a try. It smelled really nice on them. Must go give this one a try on my skin soon. The bottle really is pretty. And they all look pretty in the 40 ml “jewels”. The descriptor salty musky skin scent made me think first of Modern Muse and then of Bobbi Brown’s Beach. I prefer the latter, but didn’t like either enough to purchase. And nice that it happily surprised you. I’v pretty much lost in interest in Bulgari but will definitely give this a try! I am persistent, or stupid…I think I’ve tried every darned feminine they’ve made, pretty much on the basis of Femme & Black & Omnia. It is not beachy at all in the traditional sense of suntan oil, so nothing like the Bobbi Brown. Did not remind me of Modern Muse either, but do smell it and see if it does you! Oh, I’m so glad you reviewed this one! I’m a lapsed fan as well, I adore Omnia, pour Femme, Black and The Vert, and now I can’t wait to try this. Reveal is a bit too much for me, but I like the idea, so this might be more to my taste. You know, I kind of doubt any perfumistas are going to love this one as much as those old classics, but I do think it’s better than their recent stuff! This sounds surprisingly nice. I’m a big fan of salty notes and don’t mind watery, so I should go on and try it. Thank you for the review! I love salty in the summer, this one sounds promising! I have Bvlgari Omnia Coral in the little ‘jewel’ bottle (which is the 25 ml size, not 40 ml) and it’s my fun take-with-me scent in midsummer. Perhaps the Divina will make it a pair . . .
Oh, so glad you said that, you’re right it’s 25 ml…just fixed that in the text, thanks! !